Last week I was in Chichester and saw some wonderful, and very different, textiles. At the Pallant House gallery there is an exhibition on Conscience and Conflict. A part of that is a textile banner of Picasso’s Guernica, sewn by various community groups and coordinated by, among others, my friend Maude Casey. If you are interested and want to find out more you can Google the gallery or follow the link to Guernica on our resources page. This exhibition is only on for a few more weeks, but the gallery is very well worth a visit whenever you are in Sussex. There is heaps to see there, and a good cafe. The other visit I made there was to the cathedral. 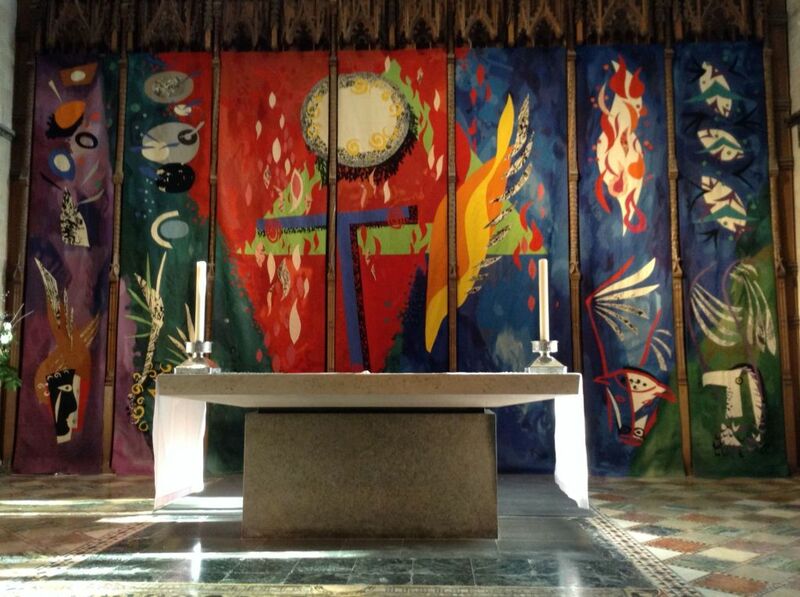 I didn’t know what to expect but was amazed and thrilled by all the textiles on show there, especially the altar tapestry by John Piper and some kneelers in one of the side chapels. Again, if you are in the area, do make the effort to visit. And again, there is a cafe so you can refresh yourself after your tour.